“The Disaster Artist” is a film where you have to continuously remind yourself that the characters portrayed on-screen are real people and that the events that transpired actually happened. The absurdity of Tommy Wiseau (James Franco) is like something out of a fantasy novel. His confidence is matched by his obliviousness. He steps onto the stage during an acting class giving a performance that borders reveals his narcissism. On the surface, his awful interpretation of “A Streetcar Named Desire” could be viewed as intentional deadpan genius. But in the class, looking on after failing to work up the nerve to put together any acting chops, is Greg Sestero (Dave Franco). Unlike the rest of the class, which looks on in gross astonishment, Sestero sees a man who’s unafraid of the lights, the crowd, and of his own lackluster talents. Sestero approaches the Eastern European sounding man, already aged with wrinkles, to figure out how to obtain that fearlessness. Although what Sestero doesn’t realize, is that that fearlessness was birthed in a pool of egotism. But what arises is one of the most bizarre creations of the 21st century. “The Disaster Artist” somewhat chronicles the beginning of the friendship between Wiseau and Sestero, which led to the disasterpiece known as “The Room,” a film that’s now shown at midnight screenings around the country and mocked much like the “Rocky Horror Picture Show.” The film is almost a love letter to the boldness of Wiseau as well as the fragile bromance that develops between the two. It’s in the Franco wheelhouse, which brings in other actors and directors from that genre, like Seth Rogen, Zac Efron and Judd Apatow. Because the film plays out as an ode and embrace of Wiseau’s misguided efforts, it does tend to gloss over some of the troubled rumblings of the production of “The Room.” Tales of gross negligence and fights are shown, and sometimes played for laughs, but we don’t get a good enough grasp on the story behind the movie. A lot of that may be because Wiseau and Sostero, in real-life, remain good friends and even still work together. It’s understandably tough to trash talk a friend, but “The Disaster Artist” could have benefitted from getting out of bed with Wiseau’s quasi-charming ambiguity. Mirroring the film’s creation, Franco is the director, lead, and one of the producers of this film, highlighting his eerily physically similarities to Wiseau as well as perfecting the mannerisms of the mysterious man who explains away his Eastern European accent as being from New Orleans and profusely lying about his age. Franco plays Wiseau as an unlikable dolt who shouldn’t be liked or applauded for his efforts. But by the film’s end you find yourself warming up to Wiseau with likability that’s almost beyond explanation to a layman. 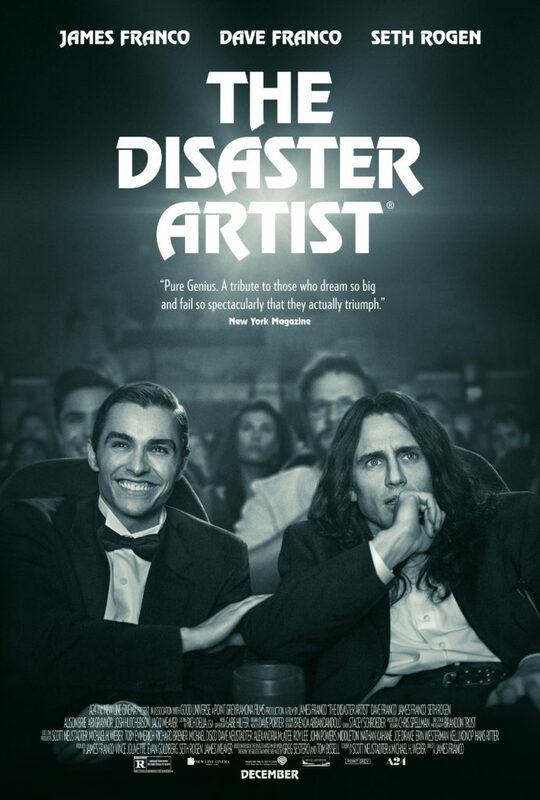 “The Disaster Artist” is more or less bonus content for fans of Wiseau’s passion project and cinematic abortion. I’m in that camp and enjoyed Franco’s recreation of particular scenes, along with the behind-the-camera retelling of insufferable moments with Wiseau, as well as the monumentous occasion where Wiseau premiered the six million dollar film that’s considered one of the worst in modern history, if not all time. For those outside that bubble of knowledge, you may find yourself wondering what all the fuss is about. For those in that bubble, you’ll relish and eat up this biographical travesty. For the first time in well over a decade, there’s a decent amount of hype and high level of expectation surrounding an “Alien” film. There’s genuine public interest and hope that “Alien: Covenant” would add another rich layer of backstory to the close-quarters terror that audiences experienced back in 1979. But at the expense of bridging the gap between “Prometheus” and “Alien,” Ridley Scott has answered a question nobody asked and poorly answered a question that’s been left lingering since 2012. The crew of the intergalactic colony ship, Covenant, is awoken mid-cryogenic sleep after a deep space electric charge frazzles their vessel. In the ensuing chaos, the crew’s captain (for some reason played by James Franco) is killed, the ship suffers extensive damage and the crew is alerted to a distress signal. What makes the distress signal curious is that it comes from a planet that’s more livable than the one they’re currently taking 2,000 colonists and thousands of human embryos to. Acting Captain, Christopher (Crudup), wants to show strength by making a command decision to halt their current path and investigate the planet’s habitability as well as the distress signal. Christopher shrugs off logical concerns by crew members, like why an extensive search of the universe by precise computer programs would have missed this unheard of planet. While he lends an ear to Daniels’ (Waterston) unease, Christopher barrels towards the unknown. I’m sure you know this won’t end well. The beginning of “Covenant” is ripe with tension, as we breathlessly wait for the best laid plans to fall apart. But once we’ve settled into the mysterious planet and we catch our first glimpse of some prototype xenomorphs, the pressure alleviates and is never reapplied. “Covenant” is covered in thick foreshadowing, that gives away its final act, even to someone who might be new to the “Alien” franchise. However, fans of the franchise will be wondering what Ridley Scott has done. He’s stripped the dread and action, leaving behind something new, yet unpleasant. “Covenant” is a visually Gothic movie that’s more fixated with body horror than actual scares. It’s more fascinated with Frankenstein rather than the monster. While it is a slightly refreshing change of pace, the human element is nonexistent and the character’s intelligence is subpar. Scott flirts a lot with man’s infatuation with creating life, discovering meaning, and tapping into what it metaphorically means to be immortal. It’s interesting to ponder, but it never evolves into anything meaningful and it’s buried under a lot of heavy exposition, robotic dialogue, and horror movie tropes. The most obnoxious of clichés is painting these astronauts and scientists like incompetent, horny teenagers stuck at Camp Crystal Lake. The Marine recruit slowly going mad. The Norse-God looking garage worker. Orson Welles. A farmer inhabited by an alien bug. A New York detective. These and dozens more are characters created by Vincent D’Onofrio. From “Full Metal Jacket” to “Adventures in Baby Sitting.” From “Ed Wood”, “Men In Black” and the long running television series “Law & Order: Criminal Intent.” From “Jurassic World” to the current “Daredevil” and “Emerald City” series, D’Onofrio is a true chameleon, adapting his talents for every new challenge. In his most recent work, he stars as London, a man with the ability to inspire and lead others, in the new film “In Dubious Battle,” based on a novel by John Steinbeck and directed by James Franco. Mr. D’Onofrio took some time out of his busy schedule to talk about the film, collaborating with Stanley Kubrick and what he’s working on next. Or as much as he can. Mike Smith: What attracted you to the project? Vincent D’Onofrio: Well, James is just an awesome dude. There’s that. And it’s something different. To do this kind of movie, out in the fields with a very low budget. No frills. Everybody there is there because of the author of the novel. The novel itself and what it means today. Just wanting to be there and participate. Knowing that it’s going to be a very unique variation of this novel in a style that lends itself to what the novel stands for in the first place. Unity. MS: Had you read the novel before you were cast? And if not, did you read it to get a sense of Steinbeck’s take on your character, London? VD: That’s a good question. I’m pretty sure I read it when I was younger because when I did read it a lot of it seemed familiar. Maybe because I’ve read so many other Steinbeck novels it seemed familiar. I can’t say for sure I read it as a youngster but I did read it. MS: You have also directed in the past (Mr. D’Onofrio directed the 2010 horror film “Don’t Go in the Woods”). Is it easier – or more comfortable – for an actor to work for a director who has a true understanding of the acting process? VD: No. All directors are different. You have to learn that. As a young actor I think you want a director who understands acting but you actually want to work with different kinds of directors. Some directors want nothing to do with your performance. Stanley Kubrick wanted nothing to do with your performance. He didn’t want to discuss the story other then how you were going to approach a particular scene. But that had to do with the writing of the scene and not the performance of it. Not what the result of it was going to be. He didn’t want to discuss it. Now we did re-write some scenes. Not just me but Matthew Modine and Lee Ermey with Stanley. We would come up with dialogue and Stanley would sit there with a typewriter and write it all. And once he wrote it would stick. There was no improvisation after that. It’s different each time and you actually welcome that as an actor. Different kinds of directors are exciting to work with. I loved that James was an actor and that he was in the film and directing at the same time. It’s really comforting to act with the director. MS: The film has a great cast of actors. Is there anyone you haven’t worked with yet that you’d like to? VD: Oh my God…there are so many. It would be ridiculous of me to even start the list. We could talk about that all day, Mike. All day. There are so many great actors that have since passed away. There are so many young actors today that I love. There are so many actors from my generation that I love that I haven’t worked with. From the generation right before me…it’s a thrilling business to be in and to be the peer of great actors is so interesting and so uplifting. VD: My gosh! I think the last thing I did that isn’t out yet – I think it’s still in editing – is the remake of “Death Wish.” Eli Roth directed it. Bruce Willis plays the lead in it and I play his brother. Not much more I CAN tell you. Everything is so hush-hush. I may do a play before the summer. But I Tweeted about it and got in trouble. You can’t talk about anything these days. It’s such a bummer. I’ll just say I have a lot of stuff coming out. A lot of stuff in the can. The year is 1934. We find ourselves in the Bolton Apple Orchards of California. Many people have picked up back east and headed west with the promise of available work and great wages. However, the influx of laborers has driven wages down, much to the chagrin of the apple pickers. A burly man named London (D’Onofrio) confronts old man Bolton (Duvall). Having been promised three dollars a day for their work, the workers have only received one dollar a day and are, justifiably, unhappy. They want to fight for what they have owed them. They only need a little nudge. Some of you reading this may be saying to yourself, “I didn’t know James Franco directed.” I am a fan of his film “SAL,” but I was shocked to learn that, if the Internet Movie Data Base is to be believed, he has no less than SEVEN films coming out this year that he directed. He really is a renaissance man! Franco also stars here as Mac, an organizer for a group that is trying to unionize the apple pickers. He had taken under his wing a young man named Jim (Nat Wolff). His eyes not truly open, Jim is drawn to the movement by the fiery rhetoric of Mac. Together they apply for work at Bolton’s orchards and try to blend in. They begin to make small talk with the other workers, trying to feel out who can be a leader and discover London. They discover that most of the workers have had their spirits crushed. When Jim makes an optimistic comment he is met with a frown. “That sounds like hope,” he’s told. But hope may be all these people need. Perfectly paced and skillfully cast, “In Dubious Battle” is one of those small films that occasionally see the light of day. With a perfect period background and an accompanying musical score by Volker Bertelmann, whose score for this year’s “Lion” has been nominated for an Academy Award, the film takes you back in time to a period when life seemed easier but surely wasn’t. And Franco seems to be the new Woody Allen in that everyone wants to work with him. He has filled his cast with some of the best (and in my case, favorite) character actors, including Ed Harris, Bryan Cranston and John Savage. As London, D’Onofrio adds another great character to his resume. Wolff begins the film clad in innocence, growing more defiant as the story progresses. Franco’s Mac is almost a step-brother to “The Grapes of Wrath”s Tom Joad, pushing forward and giving the occasional inspirational speech. I’ll admit here that I am a member of a labor union. My current home-state, Missouri, recently voted to be a “Right to Work” state. I found this film inspirational, both in content and in the commemoration of those that came before us.